Truest is a stunning, addictive debut. Romantic, fun, tender, and satisfying, it asks as many questions as it answers. Truest threw me into a whirlwind. It swept me in, carried me like a feather, and then knocked me over with a ton of bricks. The writing is gorgeous. The characters are achingly raw and realistic and oftentimes so heartbreaking. Sometimes I found myself wanting to give them each a hug, and I’m not even a hugging person. And in the end, this story is so riveting and overall stunning. Jackie Lea Sommers’ Truest is not only funny and witty, but also fist-clinching, grief-stricken, and thought-provoking. Truest contained so much love in every aspect–love between siblings, friends, parents, old friends, and new friends. But with love there is also the painful aspect of grief, loss, and heartbreak. This book is an emotional roller coaster and I could not put it down. Each chapter detailing Westlin and Silas’s growing friendship had me swooning, laughing, and gasping for air: sometimes from too much laughter and sometimes from shock. I was left with overall thoughts rationalizing the life we’re given, the people that enter our lives and forever change it, and how do we cherish the time we have with each other. 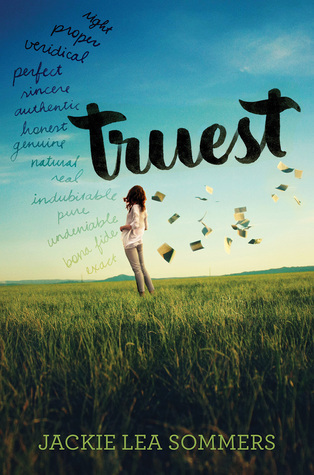 Truest is definitely one of the most memorable contemporary YA novels I have had the pleasure of reading. Note: I was not provided a copy of this book by the author or the publisher in an exchange for a review. I bought this book with my own funds, and I reviewed the book at my own discretion. All statements and opinions in this review are my own. I really loved this book!! It brings back good memories to see it here! YAY! I hope and wish more people will read it.